Our office is based at Siliguri. Communication in Siliguri is very developed and is well connected via airways, railways and roadways. It has its own airport, bus terminus and railway station. Bagdogra airport, Tenzing Norgay bus terminus, Sikkim Nationalized Transport, New Jalpaiguri railway station, Siliguri Town Station and Siliguri Junction Station are the center of all activities for travelers and tourist. Flight, Train, Buses and private car are available to travel to Darjeeling, Gangtok, Jorethang, Pelling, Kalimpong, Lava, Lolaygaon, Mirik, Dooars, Guwahati, Bhutan and Nepal along with North Eastern States like Assam, Manipur, Arunachal Pradesh, Meghalaya, Mizoram, Tripura and Nagaland. Royal Government of Bhutan also operates buses from Siliguri to the Bhutanese capital Thimpu. Assam, Bihar and West Bengal government also have state government services along with many private operators and the frequency is quite high compared to other places. Airways - Bagdogra Airport is approximately 10 kilometers from Siliguri. Indian, Jet Airways, Kingfisher, Spice Jet and Air Deccan fly to Delhi, Kolkata, Chennai and Guwahati on regular basis. Bagdogra Airport is the nearest entry point to Sikkim, Darjeeling, Dooars, Kalimpong and Nepal. Railways – It has three important railway stations and it is strange for a city as Siliguri. There are trains connecting with almost all the major cities of the country. Darjeeling Himalayan Railway is famous as it acquired the title from UNESCO World Heritage Site. A daily steam engine service runs from New Jalpaiguri to Darjeeling up to a height of 2,134 meters / 70001 feet is very popular among tourist. Town Station – This was inaugurated in the year of 1880, August during the British rule in India. It was the station used as the junction for the trains coming from Kolkata via Bangladesh. It is also known for the world heritage train i.e. Darjeeling Himalayan Railway. It is one of the oldest stations in India and is in the heart of the city. Junction Station – This came into operation in the year 1949 and is situated in the heart of the city. It used to serve for all trains to the north - eastern states. This discontinued after the New Jalpaiguri station was built for the broad gauge line and the service of the Guwahati bound trains was extended to Dibrugarh in Assam. It is suppose to be one such station in India where all the three types of railway lines exist i.e. with broad gauge, meter gauge and narrow gauge. New Jalpaiguri Railway Station - Approximately 10 kilometers from the center of the Town. It is well connected to the rest of India and especially to New Delhi, Kolkata, Guwahati, Chennai, Hyderabad, Mumbai, Bangalore, Patna, Jaipur, etc. NJP is directly connected with all major stations in North East India. It is also well connected with Chalsa, Malbazar, Cooch Behar, Alipurduar, Hashimara, Birpara and Rajabhatkhawa and all the stations in Dooars. 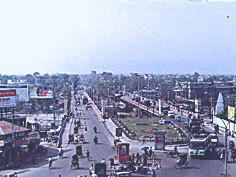 Roadways – National Highway number 31 passes through the town of Siliguri. Connecting Siliguri to the rest of India and the states of North East of India is national highway number 31 and the East West Corridor which is being laid for improved transit system it is a four lane track. National highway number 31A is an offshoot and connects Sikkim. Similarly there is national highway number 55 an offshoot of national highway number 31. Various other roads connect neighboring countries like Nepal, Tibet, Bhutan, and Bangladesh. All rights reserved [Sen Travels]. Best viewed in IE 5+ with 1024 X 768 pixels.